What's the system suitable for? 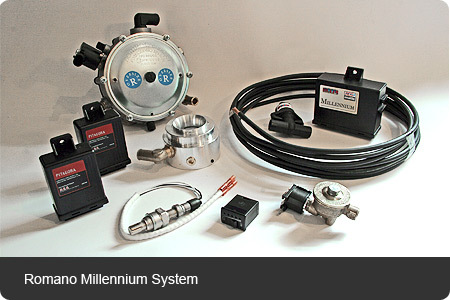 This LPG system is suitable for all Land Rover Discoveries and Classic Range Rovers running with the Hotwire fuel injection system (this is normally found on the 3.9 litre engine unless the engine has been upgraded) its also suitable for the Range Rover P38 1994 to 1999 and the Defender 90 50th anniversary. Please note that it is a requirement of all LPG systems as supplied by Partsrange (RPi Engineering) that once fitted, the installation should be checked over, set up and certified by RPi or by an LPG certified fitter. Please check with us if you are unsure if this system is suitable for your vehicle. A self fit Front End LPG Gas Conversion with Lambda feedback loop and all you need to convert your EFi. Range rover (all the engine bay equipment, but excluding gas tanks). This front end system comprises of every LPG component needed under the bonnet to convert your vehicle to LPG and includes. LPG change over switch and gauge. Once fitted the LPG switch has two operating modes which are changed between by a simple rocker switch. Petrol: As the name suggests this mode is to run the engine on petrol and the LPG system is inactive. LPG: This activates the LPG solenoids and allows the engine to run on LPG, with the petrol system inactive. This switch also has a gauge in the form of 1 Red LED and several Green ones that indicates the level of LPG in the tank.